Are you planning on making a 5th book? Please say yes, i need more of Marty and Grace. If so when does this book come out? I really could use another book! Will there be any sequels/ novels of Marty,grace or therest of the characters after the novel mutation? OMG! I just found out this last book , for which I have been waiting for years, it seems, is out and will be available at the Book Fair next week! I am at once thrilled and deeply saddened! While I can’t wait to find out if they find Marty’s parents, I am not yet ready to say goodbye to Marty and Grace! You have created, in my opinion, the greatest characters to have ever lived between the pages of children’s books! Thank you! I really love this series! Please don’t end it so quickly! This was such a great book, If possibly I would like some more duh du jours! I really loved this series, and I already miss Grace and Marty! Thanks for the Adventures, Alexa! Yeah you should make more books, your books are amazing! PLEASE make more books, I can’t get enough out of them! will martys hair grow back?does he like zebras, caues i know a zebra that would love a playmate(hes a cartoon). Yes! You should make a fifth book!! I have loved every one in this series and have come to love Marty and Grace, and it seems that their story is incomplete without seeing them try to go back to normal life, Marty with his parents and I guess Grace with Wolfe? And what about Violet? And Grace and Dylan? this is really inspiring to me and my writing. I really like these books, im wondering what would you pu for 4th book in the storm runner siries what would happen with everyone? Thank you. Logan and I have been reading about Grace and Marty since the first book came out. Loved the story and thank you. Mr. Smith my daughter really enjoys the Cryptid hunters series and is now overwhelmed and fascinated by cryptozoology. Will you like Erin Hunter end this series and make another one with the same topic and characters? My daughter thinks your books are so good the that Cryptid Hunters series should become a movie. If that ever happens we will be the first in line. After getting the entire set of all four books (Crypid Hunters, Tentacles, Chupacabra, and Mutation) for Christmas 2014, I have successfully devoured the series (through the system of nonstop reading, i managed to finish each book in about 1 day, avoiding almost all human contact so that the precious world of the characters would go uninterrupted) and I can’t even begin to say how incredible they all were. I absolutely loved Marty, Grace, and Luther, and as I neared the end of Mutation, I could feel actual pangs of panic, fear, and sadness in my chest as I knew that it was the last book in the series. A fifth book would be the cherry on top of this truly amazing array of characters, even if my selfishness just wants some more juiciness with Grace and Dylan, and to see the bond between Violet and Grace develop. What about Grace and Wolfe?! How will Wolfe tell Grace that she is technically part clone?? OH MY GOSH HOWWW? Will it be Marty or Grace who breaks the news to the O’Haras that Grace knows she is no longer a twin? Will Marty and Luther ever gain publication of their graphic novel/comic book? Do Wolfe and Laurel get together officially oh my goodness just because now Grace and Violet will need a mom too and especially since the only family Violet has known is the evil Noah Blackwood… Did Marty ever find the entrance to the Quonset hut on Cryptos Island(stupid, I know)? Congratulations, Roland Smith, for making me feel these feelings of genuine care and concern for these characters well-beings, and a major kudos to you ending the series not with a fizzle, but with a bang. PLEASE, PLEASE, PLEASE can you write a 5th book? I am a HUGE fan of these books and Marty and Grace can’t just go away so quickly! I have to know what happens to them and about Grace and Dylan. Oh and Violet too! Marty and Grace will always be my favorite book characters because I love how goofy and silly Marty can be as we’ll as smart and creative and I love everything about Grace, especially because she reminds me so much of myself!! I have learned so much from these books and I don’t want them to go away!! It would be my dream come true if these books were made into movies and If they were I would be at the first showing! I love Marty and Grace and I hope that you will write another book! I have read your IQ series, Jack series, Peak and Crytid Hunter series to kids for the past 4 years. I love them and always look forward to your latest work. i really enjoy how you incorporate characters from one series into another series! Just finished mutation. I enjoyed it ,but after all the character had been through the death of Butch and Noah seemed too easy and we never got Violet’s reason for helping Wolf. I am still hooked and look forward to whatever you have next. o my gosh!!!! i just got done with mutation!!!! these are the best books in the world!!!!!!!!!!! I have read all most all your books!! please please please dont let this be the last book in the series!!!! What about Grace and dylan? and violet? What about marty and his parents? what about wolfe and laurel? well they go back to cryptos island? i need to know what happens!!!!!!!!!!!!!! PLEASE MAKE ANOTHER BOOK!!!!!!!!!! your number one fan, Anna leigh folwell. Very sad to see the end of the series. So many questions unanswered such as how Wolfe and Ted obtained Cryptos. I was hoping that would be answered. There are others i cant remember right now but still the best series ive read. Gonna miss them. Hi, Roland. It’s Sandi Tidwell from Mowat Middle School in Panama City, FL. 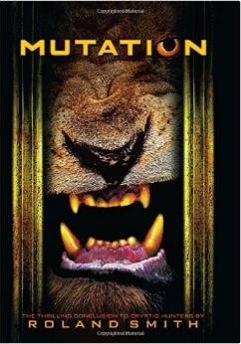 I just saw that “Mutation” has been released, and I am so excited. I retired from teaching sixth grade reading last year after promoting and reading your books to my students for the past fourteen years. In other words, I retired with you still being my favorite young adult author of all time. I am visiting my sixth grade grandson, Keelan, in Thailand this month. I went to his school library, and guess what, they have about four of your books. Last week, Keelan checked out Cryptid Hunters and Tentacles, and he has already finished Cryptid Hunters and started Tentacles. When I get back to the U.S. in a couple of days, I will be ordering more of your books for Keelan’s school library. Hopefully, a whole new group of students in Thailand will begin to read your exciting books. I told Keelan that he needs to read Elephant Run after he finishes the Cryptid Hunter series because he lives in the foothills of the mountains that separate Thailand and Burma and would understand the landscape and culture. Blessings to you! Keep on writing! I LITERALLY JUST FINISHED READING YOUR SERIES AND I LOVE IT SO MUCH!!!! YOUR WIRTING IS SO AMAZING IT MAKES ME WANT TO THROW YOUR BOOKS ACROSS THE ROOM (WHICH REMINDS ME, I NEED TO SAY SORRY TO A BOOK OF YOURS) BECUASE I AM SO ANRY AND IN LOVE WITH THE CHARACTERS!!!!!!! KEEP WRITING!!!!!!!!!!!!!!!!!!!!!!!!!!!!!!!!!!!!!!!!!!!!!!!!!!!!!!!!!!!!!!!!!!!!!!!!!!!!!!!!!!!!!!!!!!!!!!!!!!!!!!!!!!!!!!!!!!!!!!!!!!!!!!!!!!!!!!!!!!!!!!!!!!!!!!!!!!!!!!!!!!!!!!!!!!!!!!!!!!!!!!!!!!!!!!!!!!!!!!!!!!!!!!!!!!!!!!!!!!!!!!!!!!!!!!!!!!!!!!!!!!!!!!!!!!!!!!!!!!!!!!!!!!!!!!!!!!!!!!!!!!!!!!!!!!!!!!!!!!!!!!!!!!! !OR ELSE 15 YEAR OLDS LIKE ME WILL HAVE NOTHING TO LIVE FOR EXCEPT BRAIN WASHING TV. will there be another book because there is a total cliffhanger! i want to read a fifth book please! Why did you end it like that? make a fifth book I have read all 4 at least 5 times each! I wish for a fifth book! please…. something to wrap up more of marty and grace. It would be cool if rose was found. **CONTAINS SPOILERS** Having read all of the Cryptid Hunters books, along with Sasquatch and the Jake Lansa novels, I truly hope you continue with these characters. Although Blackwood has been defeated, surely this isn’t the end of the adventures of Wolfe and the gang! WIth the new discovery of Blackwood’s hideout and all its eccentricities, along with the discovery of Marty’s parents (finally! ), I’m sure you could continue to take us readers on thrilling journeys alongside Marty, Grace, Wolfe, and everyone else. Hi I just finished mutation I think it’sn the best book in the series even though chuacobra and tentacles was awesome OK I don’t know which was the best I’m going to start on beneath or elephant run which one do you think I should read first. If you come up with another critic book tell me please! I really love your books I love how whenever something boring happens you suddenly make action in the story. I can’t believe ypou visited our school one time my teacher Mrs. Tobias told me. I hope you can visit our school nappanee elemarty bulldogs again. I’m in third grade I really really love to read your books their awesome. What animal is on the cover? Also you visited my school today! I am 100% getting this book at the book fair! This book is amazing. Thank you Roland Smith for writing it. It is amazing. I just finished Mutation ,it was phenomenal. I already miss the characters they were the best. The story was great please make more!!!! If you read the area Two weeks later, towards the end you might realize that you can keep it going you said that Dr. Wolfe would return to Grace leaving us on a Clif at the end. Please make another Cryptid Hunters book . YOU NEED TO MAKE A BOOK 5 PLEASE PLEASE PLEASE. Roland, as a retired reading teacher, I loved your reply to Jack! I felt like I was saying goodbye to old friends when I finished the last book. There is no doubt in my mind that you have inspired many young adults to write! Many of my former sixth grade students (some 30 years old now) will see me in the grocery store or a restaurant and come up to me and tell me how they learned to love reading because I read them many of your books! Thank you for responding. Are there any other books like this series that you recommend for me to read. I’ve written 25 other novels. You can read about them on my webpage. I loved this series! It would be nice if you made a spin off series about just Marty and Grace or about Ted and Wolfe’s adventures before Cryptid Hunters. I love the cryptid hunters serize its so cool do you think you can auto graph all the books and send them to me.